Know when to ask for help. Know when to get a second opinion. And know when the last resort of removing poorly performing staff is necessary. Sometimes even the most thoughtful facility manager isn’t able to come up with the proper diagnosis for the department or create a wellness plan to heal the ills of the culture. Before declaring the patient “lost” forever, the facility manager has some additional resources to draw upon. One is to ask for a second opinion. Facility managers should not be afraid to seek another opinion on what to do with the organization. It is not a sign of failure or weakness to ask for assistance. Sometimes it takes someone who is not immersed in the organization and has a fresh perspective to sort through the symptoms and suggest solutions. In many companies there are internal human resource consultants available to assist departments in performing an evaluation. They typically are trained in organization assessment and development techniques. If there is anxiety over having the ills of the organization known within the company, facility managers also can utilize their external network of facility professionals to brainstorm problems and solutions, as well as external consultants that have both knowledge of the facility industry and organization culture assessment skills. At times, the internal alignment of facility management functions may not be working properly, and it is necessary to reconfigure the organization. It may be a case of mismatch between staff capabilities and assignments, which can be remedied by shifting staff into roles for which their skills are better suited, or it may be that functional dependency among organizational units has changed. In other instances, the dynamics among staff on a particular team may not be working properly and need to be adjusted. Incentives and rewards have a way of curing a multitude of ills within a facility department. Perhaps incentives for outstanding individual and group performance either have slipped by the wayside or have not been implemented, which usually leads to a disgruntled workforce. Instituting new or resurrecting old practices for recognizing performance excellence often is a great way for facility managers to revive their organization. Sometimes, it is necessary to counsel employees with disruptive attitudes to move on. Though difficult, this management act can be a means to restore vitality to an organization. Workers with a toxic attitude can do long-term harm to an organization, and facility managers need to accept and manage the problem rather than ignoring it and hoping it will heal on its own. The final and most radical act of surgery is to remove poor performers from the department. It is incumbent on facility managers to begin documenting poor staff performance when the problem first becomes apparent in order to build a solid case for severance. While a tedious and cumbersome process, the impact of terminating individuals who fail to achieve performance expectations sets a positive tone for those within the organization who are meeting or exceeding their goals and solidifies performance as an underpinning of a healthy facility department. Facility managers should keep in mind that an organizational checkup is not a one-time event, but an annual activity at the very least. Attention to assessing the organization’s well-being on a regular basis and adopting the best practice of preventive medicine is an approach that leads to every facility manager’s goal for the department: a clean bill of health. Stormy Friday (stormy@thefridaygroup.com) is founder and president of The Friday Group, an international facilities services consulting firm. She is a member of the ProFMI Commission, a governance body that serves as an advisory committee for the Professional Facility Management Institute’s (ProFMI) activities. Friday has written one book on facilities management and co-authored another. 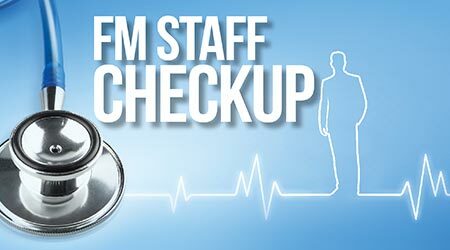 Is It Time For A Facilities Management Staff Check-Up?